PogoPlug has been making appearances in a number of products for a few years now. The premise is simple: take a low-power ARM computer, give it a NAS optimized Linux build, add storage and network access and you have what's been termed the "personal cloud." Access your files anywhere from your PC, phone or tablet; and never beholden to a data center. 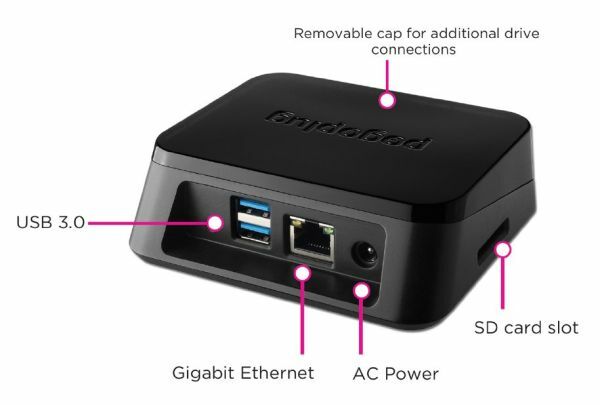 PogoPlug's particular hardware has been integrated into branded docks and also to OEM branded storage solutions. PogoPlug recently improved its service to include 5 GB of cloud storage available free to anyone interested. Today, PogoPlug introduces their Series 4 device, an update that adds one key addition. Like the original Seagate DeskStar dock, the Series 4 acts as a dock for Seagate GoFlex mobile hard drives and includes an SD card reader, Gigabit ethernet, single USB 2.0 port and two USB 3.0 ports. The USB 3.0 addition is new, and while the added throughput might be wasted to slow broadband and cellular access, the performance should help with local streaming. We can expect more personal cloud devices coming our way. While the convenience of storing all your data in a massive redundant data center is great, having to contend with network difficulties and service fees can be less than ideal, particularly the high costs of expanding storage. Personal cloud devices remove the fees and storage barriers, and leave users with the task of optimization and network upkeep. If you're up to the task and interested in expandable cloud storage, this may be one of the best options around.The Series 4 is available now at your favorite e-tailer for $99. The PogoPlug Series 4 has a critical file bug in both PC and Mac formatted drives: It loses meta data such as the creation date. This is crucially lost information when storing video or photos. It still hasn't been fixed by PogoPlug since June 2012. I have had to retire my PogoPlugs because of this bug. This bug makes them useless for back-ups.